There’s something really cathartic about watching stuff get manufactured. Whole shows have been spawned from this idea, and Super Deluxe has even harnessed slow-motion videos of the production of jelly beans and LPs for its “Stoned Mode” series, thus once again proving that stoned people will watch anything as long as it’s set to cool music. Now a video from one of those aforementioned manufacturing-heavy TV shows, How It’s Made, has popped up on Mental Floss, and though it’s a couple of months old, it’s still downright mesmerizing. 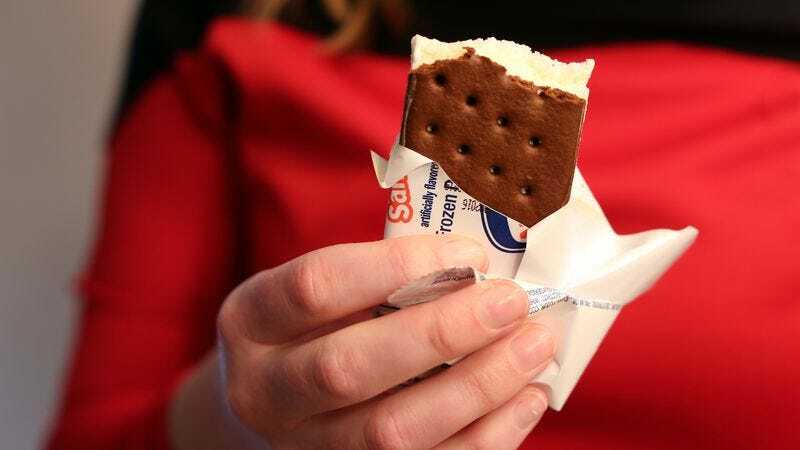 The clip, aptly titled “Ice Cream Sandwiches,” goes through the process of how ice cream sandwiches are made, from wafer baking to the almost eerie precision with which a giant ribbon of ice cream is cut and sandwiched. Though the whole clip is about five minutes long, one need only stare blankly at this endlessly looping gif to really get the gist of the process, which is both delicious looking and weirdly empty.